The tanks are filled up and start your engine because the journey to the mystical Route 777 is about to commence. Jump on your bike and feel the cool refreshing air as you ride on a straight desert highway. Playing online slots can't get better than this, can it? Elk Studios is a leading Swedish software developer with many years of experience in the iGaming industry. They boast of a huge portfolio of high-quality casino games that are packed with numerous features and symbols. Route 777 slot will provide you with the opportunity to enjoy a ride from New York City to the West Coast, and if luck is on your side, you will arrive at the Golden Gate bridge. Expect features like re-spins, free spins, and the Fortune wheel. This is the second titles in the suit of engaging and innovative Mobile First 3 reel slots. 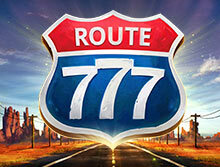 Playing Route 777 is not only fun but too, allows you to win up to $400,000 coins. Elk Studios developers have to use a simple yet appealing theme in Route 777. You can easily tell the theme of the game going by the symbols and features used. At the top of the game, you will get a closeup view of the desert, with deadly scorpions, rattling snakes, cactus plants, and maybe what looks like an abandoned old truck. Also, you will enjoy a good view of the sandy desert landscape at the backdrop of each side of the reels. So, if you are looking for a game that will offer you a ride down the deserted highway, Routte 777 will take you there. Leveller Strategy: it boosts your wager two levels up after every five consecutive losses. Booster Strategy: it increases you by one after every loss. Jumper Strategy: it increases your bet level after every win. If you are looking forward to seeing a gang of motorcycle riders filling the reels, Route 777 slot will disappoint you. 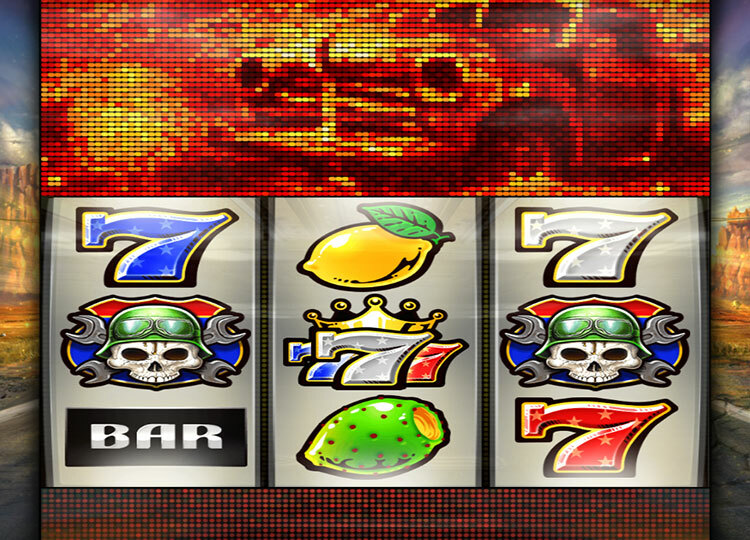 The developer has decided to use the classic slot symbols to create a new slot. The reels are set on Route 777, and you will be the only road user at this time of play. This slot is a real reflection of the one-arm bandit slot machines in brick and mortar casinos. ELK Studios have used different symbols such as Bars, White, Red, and Blue Sevens, Double and Triple Sevens with crowns, Cherries, Limes, and Lemons. Unfortunately, the game does not have a wild symbol, but they have included a scatter symbol to help you win. Skull scatter will occasionally appear on the reels, landing three or more of these symbols will activate the free spins bonus game. Overtake Re-Spins: they are activated with five respins anytime the identical symbols hit on the first two reels. You will notice that the first two reels merge and move adjacently downward for each spin. It should be noted that Overtake re-spins can only be activated in the Normal game mode. Free Spins Bonus Game: it is activated when you make a combination of three or more Skull symbols or the Scatter anywhere on the reels. Also, landing three Skull symbols anywhere will stop the Overtake Respins and initiate the Free Spin Bonus Game during the Overtake Respins. Fortune Wheel: this feature will be activated when three skull symbols show up during the Free Spins Bonus Game. Any hit on the Fortune Wheel will make the wins to increase in the same matrix. The spins will go on until three identical Sevens are obtained. Playing a classic online slot has never been this fan! Route 777 is developed using the latest cutting-edge technology which enables it to be played on different mobile phones and tablets. You will experience smooth gameplay and beautiful graphics on mobile phones powered by Android, iOS, and Windows operating systems among others. The exciting thing is that you don't have to download software, Route777 is available instantly standard browsers like Chrome, Firefox, Safari, and Microsoft Edge. A generous maximum payout of up to 400,000 coins. Combines old-school classic and modern features. We recommend Route 777 classic slot to beginners as well as experienced slots players. You will get the chance to enjoy great sound effects, high-quality graphics, not mentioning the adventurous road trip on the highway. The theoretical return to a player in Route 777 is 96.2%, and with a high variance, hence, it can be played by people of different budgets and across various mobile devices.